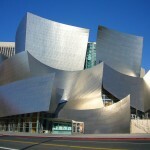 From the moment I first learned that Don Giovanni was going to be staged at the Walt Disney Concert Hall, I was curious about what it would be like. The venue, after all, was designed for concerts, not opera performances. But with the LA Philharmonic Orchestra conducted by Gustavo Dudamel, and a cast featuring Mariusz Kwiechen, one of the most famous recent interpreters of the Don, the musical promise was enormous. 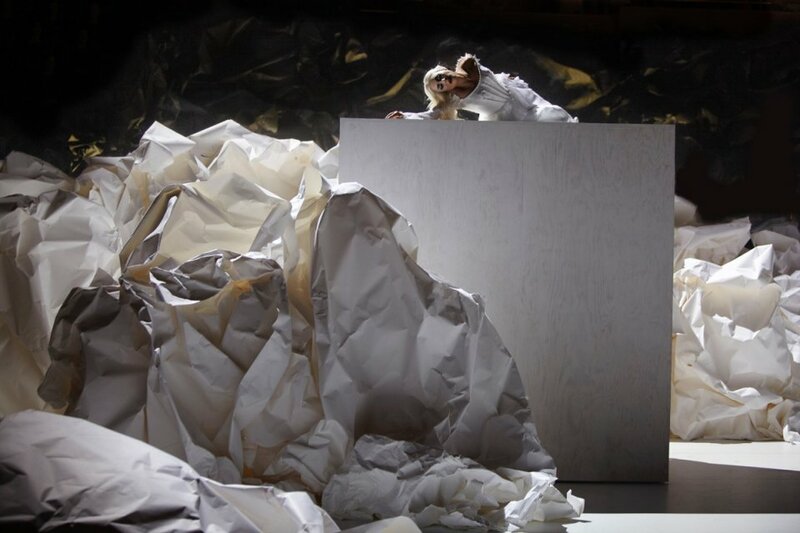 Furthermore, with set design by world-renowned architect Frank Gehry (who designed the Concert Hall itself) and costumes by famous fashion designers Kate and Laura Mulleavy, there was a definite promise of eye-candy. The results, however, were mixed. Very, very mixed. The orchestra, Dudamel and the singers were all in top form. The promise of musical excellence was outstandingly fulfilled. But the drawbacks of staging opera in a concert venue were in evidence all the same, and the production itself, visually and dramatically, was a mish-mosh of stylized nonsense. It was one of those avant-garde minimalist productions that some people find wonderfully creative and compelling, but that leave me thoroughly confused and cold. Besides the musical quality, the aspect of the performance I enjoyed most was simply getting to visit the landmark that is the Walt Disney Concert Hall. Compared to the Dorothy Chandler Pavilion, which sits across the street from it, I haven’t visited the Concert Hall very often, but still, I love it. 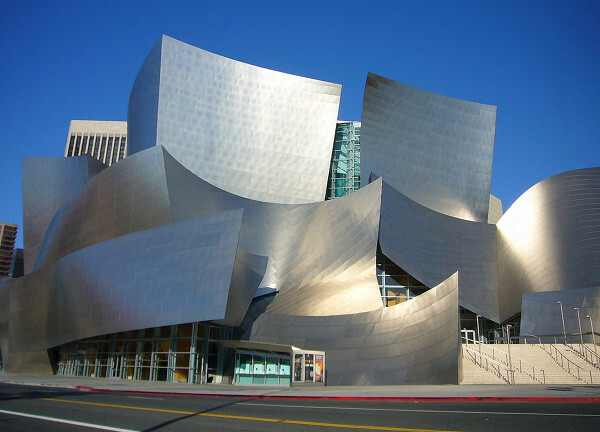 Frank Gehry’s twisting and turning architecture, reportedly inspired by crumpled paper but wrought five stories tall in stainless steel, is unforgettable in its strange, modernistic (or rather “post-structuralist”) beauty. The inside is all sleek modern elegance, white and wood-brown, with bright multicolored carpeting whose pattern is also used on the seats in the auditorium. The lobby includes an outstanding gift shop, full of music, books, and all types of souvenirs. The enormous auditorium is equally striking, with its sloping ceiling, seats on every side, and the most inventively designed pipe organ anyone is ever likely to see. If only the production had been as appealing as the venue. The unit set was distinctively Frank Gehry, I suppose. It didn’t just draw inspiration from crumpled paper: it was crumpled paper. 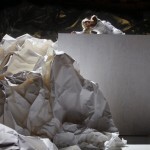 Gigantic heaps of crumpled white paper all over a stark white stage. 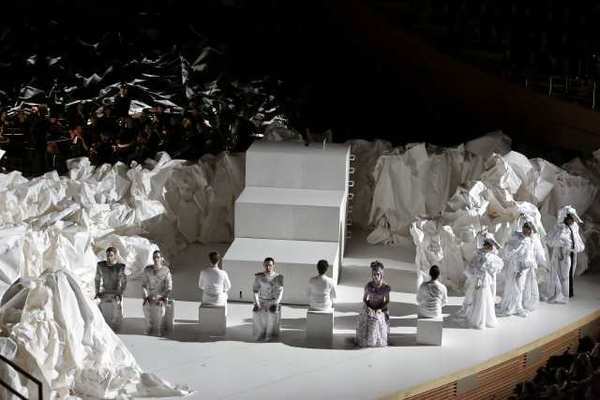 Additionally there were white plywood blocks of various sizes, hauled around the stage, kabuki style, by a group of white-clad stagehands for the singers to sit, climb and lie on. If this sounds unattractive and senseless, that’s exactly what it was to me. Granted, the staging of the Catalogue Aria brought an iota of meaning to it. Rather than reading the numbers from a book, Leporello “read” them from the giant paper heaps. “All right,” I thought, “so the crumpled paper represents the catalogue and the Don’s masses of discarded women.” But understanding it didn’t make me enjoy it. The costumes were surreal, timeless creations. All the men, including Don Giovanni, wore simple, nearly identical form-fitting white suits, except for the Commendatore, who wore a black suit of the same style when living and spiky black armor as a “statue.” There was no real visual attempt to distinguish Don Giovanni from Leporello, Don Ottavio or Masetto, and neither he nor Leporello changed their appearance at all when “disguised” as each other. The women, on the other hand, wore flowing gowns that glittered with Swarovski crystals, and each had her own distinct identity. Donna Anna was a virginal blonde in white, Donna Elvira a glowering brunette in black, and lively Zerlina had purple hair and wore light purple embroidered with flowers. In Act II the gowns became tattered, with visual symbols of their wearers’ trauma at the hands of Don Giovanni: Donna Anna’s gained blood-red streaks, while Zerlina’s changed from purple to gray. I assume the intent was to drive home the idea that the women of Mozart and Da Ponte’s operas are richer characters than the men, and that Don Giovanni’s true appeal comes not from the Don himself, his escapades or his damnation, but from his three vividly-drawn female victims. A very valid, very PC interpretation of the work, though of course not every opera lover will agree with it. I wouldn’t have minded the visual strangeness (not too much, anyway) if the staging had been full of insight and humanity. Alas, that wasn’t the case. Christopher Alden proved to be a director in the Robert Wilson mode. The singers moved around the stage in stylized slow motion, never interacting in a natural, human way and often singing without even looking at each other. There were no props (Don Giovanni “killed” the Commendatore with a simple slash of his hand and the “dinner” scene contained no actual food) and the chorus sang from seats behind the orchestra, with only the principles onstage. While I know that some people adore this style of staging, particularly because of the emphasis it places on the music, it did absolutely nothing for me. 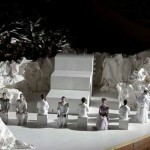 In my mind, opera needs to be a full synthesis of music and theatre. If I wanted supreme emphasis on the music, I would just listen to recordings and never bother with live performances. Fortunately, the musical aspect was far, far superior to the visual. 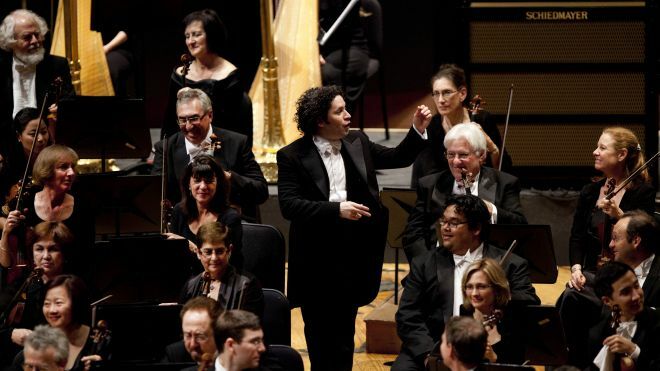 Gustavo Dudamel and LA Phil were arguably the true stars of the evening. Partly this was because the venue was their “home turf,” designed for them and not for opera. Despite the Concert Hall’s famously good acoustics, the singers’ voices tended to sound echo-y and were often drowned out by the orchestra, which by contrast sounded bright and clear throughout. 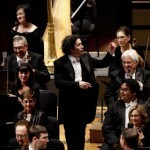 But Dudamel and his musicians also triumphed thanks to genuine skill. Dudamel’s reading of the score was neither airy and “period” style, nor heavy and Romantic (though I think it leaned slightly toward the latter), but an excellent in-between. The overture pulsed with Sturm und Drang, yet the music of the peasant characters had all the appropriate lightness. And while I didn’t appreciate the singers’ being drowned out, I was overjoyed to hear details of orchestration that I had rarely, if ever noticed on recordings of the opera. For example, the sparkling harpsichord during Elvira’s “Ah, fuggi il traditor,” the thundering drums and bright trumpets in the Act I finale, and the eerie use of woodwinds in the Commendatore scene. Any performance that reveals new details of a familiar score is one that I applaud enthusiastically. Mariusz Kwiecien (Don Giovanni): What can I say? This man (along, perhaps, with Erwin Schrott and Ildebrando d’Arcangelo) virtually owns the role of the Don in the major opera houses of today. Even in this production, his was ideal for the role: handsome, elegant, fearsome and seductive, with a deep, luxurious bass-baritone. Of course, his talents were better displayed in the recent HD Simulcast of the Met’s traditional Giovanni, but he still made a strong impression here. Kevin Burdette (Leporello): I was surprised to learn from the performance program that this man is a bass. He sounded like a baritone to me, with a fairly light timbre and a slight edge to his voice that reminded me of a young Piero Cappuccilli. But he was a perfectly fine singer and actor. If he made less of an impression than other Leporellos, it was mainly because the production didn’t give him room to establish a complex relationship with the Don. I also admired his physical dexterity: of all the stylized movements on display, his were the most elaborate and marionette-like. I give him kudos for pulling them off so effortlessly while singing, though I really would have preferred a human Leporello to a marionette one. Aga Mikolaj (Donna Elvira): This woman was a student of Elisabeth Schwartzkopf and expertly displayed the same fiery temperament that her late teacher displays in Giulini’s classic Giovanni recording. She was fully convincing as an enraged drama queen with a vulnerable, lovesick heart. All staging-reservations aside, her mixture of anguish, horror and anger in her last encounter with Giovanni was possibly the best, most believable take on that scene I’ve experienced (too many Elviras switch from pure love to pure rage with ridiculous abruptness). Furthermore, she sang with a rich, dark voice that contrasted perfectly with Remigio’s more ingénue-like sound, while still remaining pure and sopranoish. No complaints here. Pavol Breslik (Don Ottavio): Another beautiful, agile voice with a pure, deep caramel-colored timbre. It wasn’t his fault that the production made him a dramatic non-entity: Ottavio’s character is difficult to make interesting even in the best productions and this one didn’t even seem to try. Anna Prohaska (Zerlina): Yet another immensely talented artist. Her voice was smallish, especially for this venue, but very pretty, with a tone slightly darker than Remigio’s yet lighter than Mikolaj’s. Furthermore, she was more “alive” throughout the performance than anyone else onstage, except possibly Mikolaj’s Elvira. Her Zerlina was a truly vivid, pulsating creature: charming, fun loving, quick-tempered and tenderhearted. She, out of all the singers, seemed like she belonged in a different production, one that encouraged humanity onstage. Ryan Kuster (Masetto): He looked good and sang well, but made no more dramatic impression than Breslik’s Ottavio. Stefan Kocan (Commendatore): An appropriately imposing stage presence with an appropriately dark, powerful and imposing bass voice. That’s really all that anyone can ask for in the role. If his singing felt underwhelming at certain moments, it was probably because the sheer majesty of Mozart’s music for the ghostly statue encourages near-impossible expectations for any singer. Ultimately, I’m glad I saw this performance. The cast, Dudamel and the orchestra were all fully worthy of the ovation they got from about half the audience. I would even have been able to forgive the acoustical drawbacks of the venue, if only the production had made more sense. Throughout the evening I remembered Mariusz Trelinski’s almost-equally surreal and puppet-like Giovanni that I saw at the Dorothy Chandler several years ago. I thought that staging was bad at the time, but at least Trelinski made clear his interpretation of the story and how he felt about each of the characters. In this staging, I generally had no idea what Alden was trying to convey, and my friend who came with me, who had never seen Giovanni before, didn’t understand what was happening at any point in the story. I’m no traditionalist snob. I’ve seen avant-garde, minimalist productions before and enjoyed them. But I don’t like to see an opera made confusing and stripped of its humanity in an attempt to be creative. Don Giovanni is, of course, a mythical story, so I understand the temptation to make it surreal and reduce the characters to stylized, puppet-like archetypes. But to my eyes and ears, there’s nothing stylized or puppet-like about Da Ponte’s libretto or Mozart’s music. At its best, this opera doesn’t just depict a myth, but the tragicomic tribulations of seven richly human characters who arouse sympathy, laughter, disgust, attraction, horror, and maybe even identification. I’m profoundly grateful that the LA Opera is staging this same opera next season, in a new production that, judging by online photos, will be blessedly traditional. I can hardly wait to see it! As for this production, the performers were exceptional, but the finished product was a missed opportunity.